The Gardens is committed to showcasing beautiful gardens appropriate for a semi-arid climate while advancing water-efficient gardening and agriculture principles through educational programs and partnerships. Outdoor water use accounts for more than half of Denver’s water consumption. The Gardens is committed to showcasing beautiful gardens appropriate for a semi-arid climate while advancing water-efficient gardening and agriculture principles through educational programs and partnerships with likeminded organizations. The Gardens’ and Metropolitan State University of Denver’s (MSU Denver) jointly managed One World One Water Center became a partner organization in the United Nations FAO’s Global Framework on Water Scarcity in Agriculture. This will expand opportunities for collaboration on research and symposia on water-efficient agriculture. The Gardens recently installed four solar-powered atmospheric water harvesters – three at York Street and one at Chatfield Farms. Using the power of the sun, these SOURCE units accelerate the condensation process to convert water vapor into water. Denver Botanic Gardens’ Center for Global Initiatives and the One World One Water Center (OWOW) are part of a binational effort to spur more collaborative management of the Colorado River for social, economic and environmental benefit on both sides of the border. The Gardens is a signatory to a recent memorandum of understanding (MOU), signed March 22, 2018 between the City of Denver and the city of San Luis Río Colorado (Sonora, Mexico) that lays out several cross-border collaborations. As part of the agreement, the Gardens will spearhead the development of a master plan for a botanic garden incorporating wastewater from the Mexican city’s wastewater plant. This work is part of the Gardens’ commitment to helping build and expand capacity for botanic gardens globally through the Center for Global Initiatives and to furthering water-wise landscape and agricultural practices through OWOW, a collaboration with MSU Denver. Metropolitan State University’s (MSU) One World One Water (OWOW) Center — MSU Denver and the Gardens joined forces to share leadership and management of OWOW. This move strengthens both institutions’ ability to impact varied water issues and benefits multiple audiences: MSU Denver students pursuing an interdisciplinary Water Studies degree; Gardens’ visitors and members; and our surrounding communities. Plant Select — The Gardens co-founded this program with CSU to seek out, identify and distribute the best plants for our region. PlantTalk Colorado — Another CSU collaboration, PlantTalk offers many water-smart gardening tips, like this how-to video on building your own rain barrel. Denver Water — Support from Denver Water as well as the Rocky Mountain Chapter of the North American Rock Garden Society has helped fund sub metering in the Rock Alpine Garden to better monitor water usage there. After a season of monitoring, we now know that the typical water usage in that garden is approximately six gallons per square foot during the growing season. By comparison, a typical square foot of turfgrass needs 18 gallons per square foot per season to sustain it. Watershed Summit — In partnership with several Colorado organizations, the Gardens will host the fifth annual Watershed Summit on June 27, 2019, convening 250+ water professionals to discuss technology and innovation, sustainable development and agriculture. Alliance for Water Efficiency — In 2011, we became the first public garden member of this national organization promoting the efficient and sustainable use of water. Colorado Nursery and Greenhouse Association — CNGA works with the nursery and greenhouse industry of Colorado to implement industry best-management practices. Sterling Ranch — This sustainability-minded residential development worked with the Gardens to create a low-water demonstration garden. Urban Drainage and Flood Control District — The Gardens works with the UDFCD to help monitor and determine stormwater benefits associated with the Mordecai Children’s Garden green roof. Colorado Water Conservation Board video — Enjoy the video about "Doing More With Less: The Challenge and Opportunity of Water Efficiency." Several York Street gardens, including the Laura Smith Porter Plains Garden and Dryland Mesa, are not irrigated at all. Chatfield Farms has cut its water use in half over the last few years by converting from sprinkler to drip irrigation for nine acres of pumpkins grown for Pumpkin Festival. Additional changes in soil management (using cover crops and composting to build soil organic matter) at the CSA have also improved water efficiency by increasing the water-holding capacity of soils. As the first green roof built on a city-owned building in Denver, the green roof over Offshoots Cafe at York Street demonstrates the benefits of green roofs to communities and the environment. Gardens Navigator includes a virtual tour featuring plant species data and irrigation records to gauge each plant’s suitability for green roof applications. Since June 2006 the Gardens has participated in The Community Collaborative Rain Hail and Snow Network, a citizen science project tracking precipitation. Every day of the year, a precipitation report is submitted using the CoCORaHS approved gauge. The information submitted through this program is used by climatologists, weather forecasters and a wide variety of government and scientific entities to track the effects of precipitation on people, crops, wildlife and ecosystems. Water 101 - Save some blue and green! How will population growth and climate change impact water supplies in our semi-arid climate? How did Colorado water law develop, and how is it unique? What professional and personal opportunities exist for water stewardship? A new online certificate program gives lifelong learners the opportunity to explore answers to all of these questions. 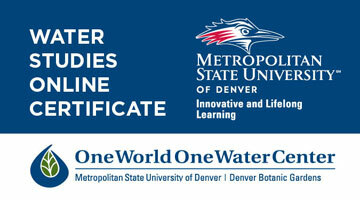 The One World One Water Center, a jointly managed program between Denver Botanic Gardens and Metropolitan State University, is offering Gardens members a 10 percent discount on a new online water studies certificate. Use promo code: OWOW10. NOTE: The code box pops up AFTER entering credit card information.